It's time for another week of Copy Cat Closet. This week's inspiration by Ma Nouvelle Mode is bringing a Summer Dress to Fall! My sister was in town visiting this week, so I recruited her as my model. It's much more fun to be the photographer instead of the model. It is just so hot still here in FL that we can easily get away with summer dresses, but it is a bit cooler in the mornings and evenings so it's nice to be able to transition a cute dress from the heat to the cooler weather, getting a bit more use out of it. Our inspiration look used a flowy white dress and added some boots and a chambray shirt to make it more autumn like. 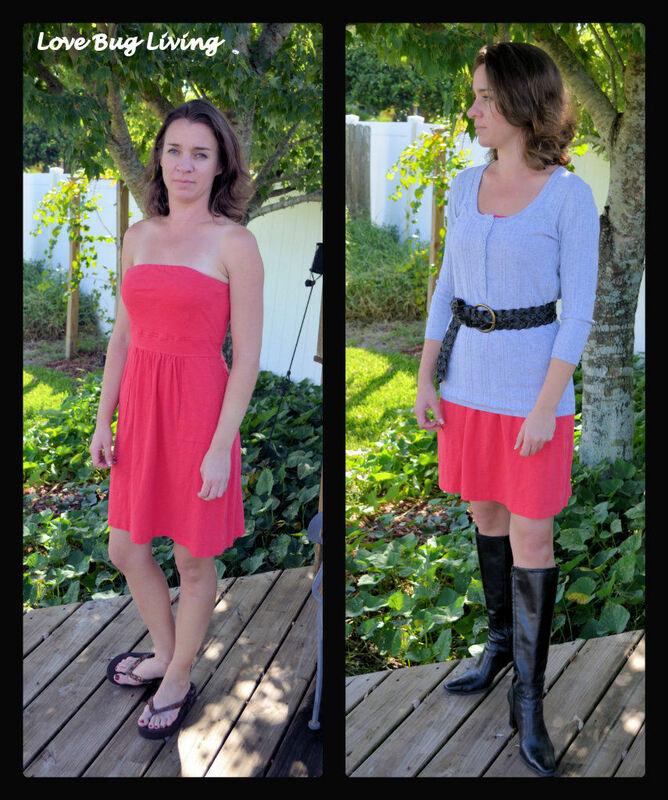 We found a fun coral strapless summer dress as our base look. We added a hip length gray sweater and belted it to bring it together. Black boots finished off the look. The bright color is still there, but it is definitely ready for the new season! 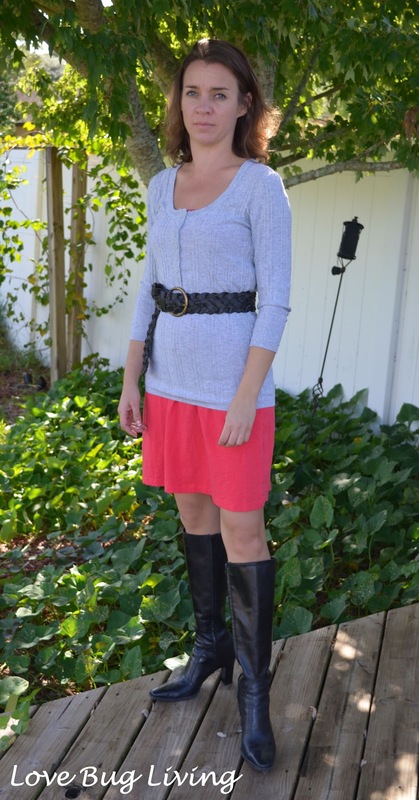 Dress - Banana Republic outlet, Sweater - Daisy Fuentes (Kohl's), boots - Michelle D (Dillard's), black belt - Faded Glory. Looking for a great deal? Use code TENBLOG at kohls.com until December 23rd to receive 10% off your online order. It can even be stacked with one other code for even more savings! I'm so glad my little sis was here to help me with this Copy Cat Closet. Another fun challenge we can relate to. It was so much fun to do it together. You are welcome to be my model again anytime! I love this look! You took a bright summer dress and made it perfect for fall! Well done, it looks great! Super cute! I would LOVE for you to link this up at my Ginger Jamboree Link Party! !